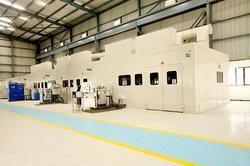 Offering you a complete choice of products which include spray system turnkey project plant. By keeping track of latest market development, we are actively engaged in offering superior quality range of Spray System Turnkey Project Plant. We provide these turnkey projects to various industries as per their special needs and demands. Our offered plants are acclaimed for their hassle free management, cost effectiveness, reliability, and flexibility. It is designed using premium quality components and latest cut edge technology to meet the standard laid down by the industry.